Five new lieutenants assumed position in July 2015. 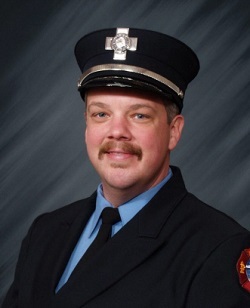 I just started my 17th year serving as a firefighter, paramedic, and apparatus engineer over the years. I have been assigned to station 4 on the B shift. A great station with a great crew! There have been some great bosses that I have worked for. I plan on using some of those leadership qualities that I have observed over the years. Do you like to help people? If not, look for another profession as the fire department is not for you. If you like to help to people, get your feet wet by volunteering with a fire department and taking some classes. Learn something new every day. It could be something that you read or something as simple as reviewing a piece of equipment from the rig that you have not used recently. Keep learning. Without a doubt, this is the best profession there is. We are living the dream!